I am in the habit of filtering my thoughts. We all do, I suppose – social filters, conscience filters, sieving self to the sort of person we want to seem to be, to ourselves as much as others. For many years I have thought the ideas which move through my head, the things I see, to be somehow wrong – just not the right sort of thoughts to be having. Only in the last few years have I started to let them be – stopped selecting, stopped clamping the wrong ones; started looking at what’s there. Life has become immensely richer. I started writing on scraps of paper. They could be easily lost, disowned; no one could hold me to a scrap. A few years ago I moved to tiny yellow notebooks. This felt daring. Entries were still spasmodic, deliberately out of order. Then the yellow pads were discontinued. I tried this and that…nothing seemed quite right; I was going to have to get bigger, and this worried me. A bigger pad suggested that I or my thoughts, or both, were more important. I felt neither, but eventually moved to Moleskine – half a size bigger, thicker, tougher. Can be squashed in and out of a pocket countless times and remain intact. I love these pads. Now, I am writing a blog; a big step from the privacy of Moleskine. I have sat on the thought of it for a while, for every day there are moments which seem to me underlined; when I might stop to think, ‘I am alive at this moment, to see the cradle rock of this feather floating to the ground’. I write this blog to give my evidence. But I am nervous. Nervous of not being good enough (enough for what, I wonder?). Worried that a blog is an indulgence, like eating all the Lindt bunnies. It is, perhaps, but the attempt to find myself in the sea, or in a wood, or on a mountain are some of the most interesting, satisfying, extraordinary experiences of my life. I have nothing more worthy to record. I know too that my words never seem to find the perfect shape for my feelings, but that I will never write another word if I hold out for perfection. These words are a try. An essay is a try, but an essay sounds grand, and suggests competence. My words are an attempt, a tentative attempt to record the times I am most alive. 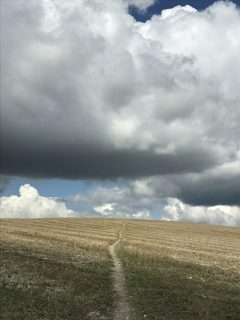 I will be writing about walking and swimming, mostly on my home ground: the South Downs, and the Channel. I feel, wistfully, that if this blog rested on magnificent alpine summits and arctic treks it would seem infinitely more justified. But I do not live a life of tremendous exploits, and sometimes, even as I dream them, I wonder if my joy would be greater if the mountains were three times higher. I have moments when I feel whole and wholly happy; it is difficult to imagine being more. My grandfather sometimes took part in Mass Observation, writing a day from beginning to end for posterity, and I have many times read with wonder his account of a Christmas Day in the 1940s- not least because it was normal for a not well off family, whose wage earners were a teacher and a journalist, to have their help cooking their Christmas dinner, instead of tending to her own! This blog will be my solo observation. Moments in time and mental ramblings. I write this for my children to read one day, in the hope that they will come to care for some of the things which make my life so rich, and for anyone who loves the sea and hills and skylarks as I do.